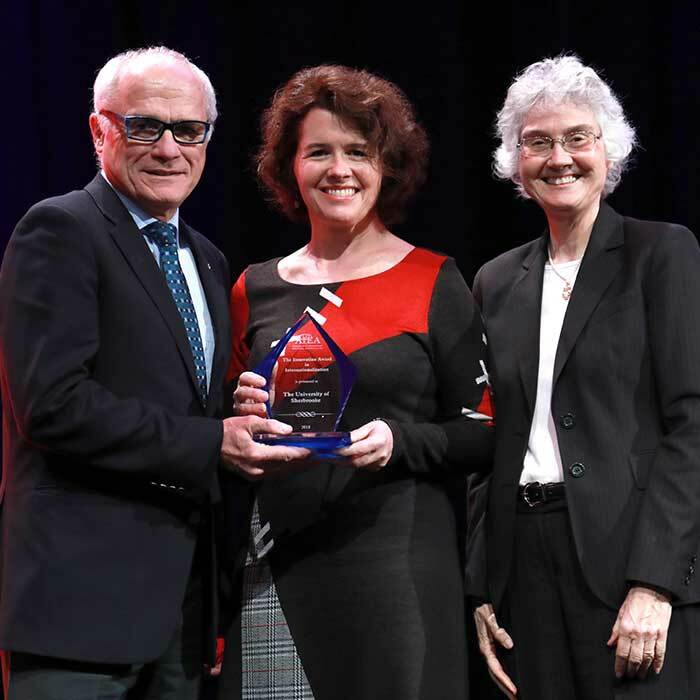 Pictured: Nell Pynes presents the University of Sherbrooke with the 2018 Innovation in Internationalization Award. The project must be widely and easily replicable at other institutions. The project must be viable with an infusion of less than $10,000. The project must address at least one of the six elements of comprehensive internationalization. The project must be able to demonstrate assessment results that confirms its effectiveness. The project must be supported or led by a Senior International Officer. The narrative describing this project must not exceed 5 double-spaced pages in 12-point font. The narrative must address the following elements of the project: history, funding, implementation, operational details, targeted audience, intended outcomes, actual outcomes, five-year projection. Nominations should provide a detailed sketch of the project’s origins, reach, and composition. Projects that are unique innovations within the overall field of international education will be favored over those that have precedents in other institutions, although overlapping goals and structures will be common. Nominators need not be AIEA members or from AIEA member institutions. Self-nominations are welcome. Nominations should be submitted to AIEA using the online form by October 1.